The EVE EPO classroom experiment involves the low-cost Sudden Ionospheric Disturbance (SID) monitor from the Stanford Solar Center. It has been developed as a Skyline High School course for the St. Vrain Valley Math, Engineering, and Science Achievement (MESA) program. The MESA mission is to prepare students for undergraduate careers in math, engineering, science and technology. MESA has a particular focus on students from groups that are under-represented in science and other math-based careers. MESA courses are held through after-school sessions or in elective classes held during the regular school day. Over 90% of the MESA class of 2005 enrolled in the college of their choice. Eight states participate in MESA. The St. Vrain MESA program in Colorado has grown from one program with 20 students in 1999 to 47 programs with over 900 students participating in 2007. 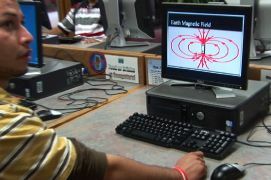 The EVE-MESA project was piloted in 2007 as an elective course at Skyline H.S., St. Vrain Valley School District, CO. The course was offered to recent immigrants and English Language Learners as part of the regular school day. For many of the students, this course was the ONLY science course open to them due to language limitations. Dr. Murillo (Skyline H.S.) introduced science content in English, but used Spanish as needed for discussion and questions. Final student presentations were given using Powerpoint in English. Contact Susan Buhr or Mark McCaffrey at CIRES for information about this course. The Skyline H.S. pilot course is being offered again in the 2008-2009 school year, and the course is being adapted into smaller modules for an after-school environment, and will be piloted at up to four after-school MESA sites this year. An EVE-MESA student learns background knowledge and computing skills. 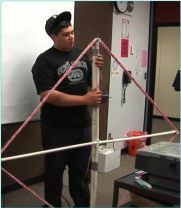 A student builds an antenna for use in monitoring solar activity and the ionosphere. Additional classroom material related to Space Weather is available from the CU CIRES Outreach site and the Space Science Institute.